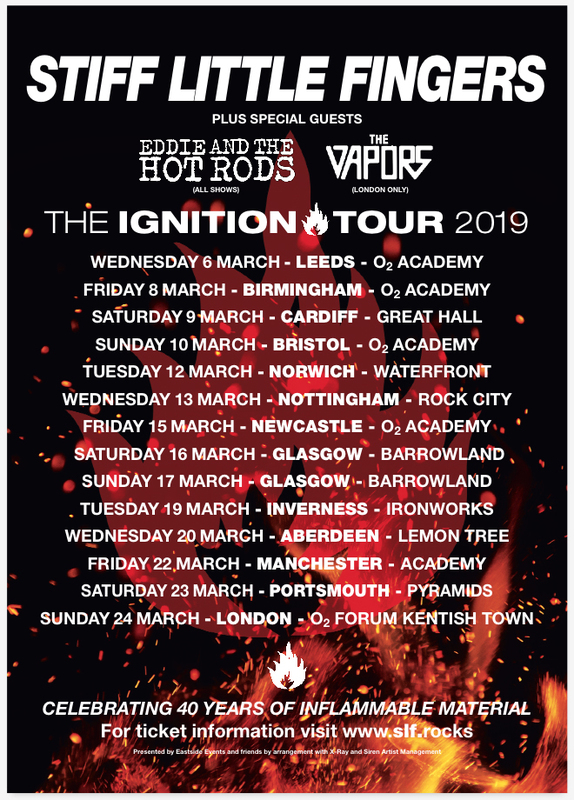 We are very pleased to announce we'll be special guests for Stiff Little Fingers on their Ignition Tour in March 2019. Whilst the plan was to no longer tour after 2018, we saw this as an opportunity that we couldn't pass up. As the final dates for 2018 were published we received a lot of messages from people disappointed that we wouldn't be heading far up North... or East, South, West. It hasn't been feasible for us to hit all the places we'd have liked to on our own but this tour gives you one final chance to see us on the road. This is it, one more run around the UK in the lead up to our special one off celebration show in April. We're looking forward to heading out with Belfast's finest, and hope to see as many of you as possible along the way. Done Everything We Wanna Do: All VIP packages have now sold out, but general admission tickets are still available. This is set to be a very special one-off evening celebrating everything Eddie & The Hot Rods. Don't miss it!